Mental, emotional and spiritual issues are not the easiest problems to reveal. We depend on what the patients tell us or what we can sense or suspect through body language and use of specific words during the consultation. The body does not lie. If one can read it, it will tell what state it is in and what remedy, or at least what type of remedy it needs. There are windows of perception into the deepest mental situations even when the physical appearance seems to deny it: the bronzed athlete or the beautiful, lascivious woman can be depressed, anxious or schizophrenic. They will just hide it better than the common human. The diagnostic methods of Traditional Chinese Medicine (TCM) can be used by homeopaths, especially in situations relating to very intimate problems that might be very difficult if not impossible for the patient to relate to the practitioner. Those methods allow pinpointing a group of remedies or a precise remedy without the need for the patient to perform a disturbing "psychological strip-tease". This method has been, in my experience, the key to opening cases, unlocking suppressed and repressed memories, feelings and symptoms, allowing a faster and deeper analysis and eventually a correct prescription. Most homeopaths who 'dabble' in Traditional Chinese Medicine (TCM) just stick to pulse and tongue diagnosis and would have a general idea of the main links between organs and mental processes - but this would undoubtÂ­edly seem pretty inadequate to a fully trained TCM practitioner. It is definitely an attraction that TCM provides a means of accessing what is going on objectively through physical observation and the simplest of factual case-taking. Patients do not have to be prepared to spill the emotional beans at the first appointment to get a good prescription. The practitioner can work out what the causative problem is likely to be from those observations and go straight to the point. At least that is the theory. There is nothing very simple about TCM. though, or how a theoretical 'Chinese' understanding can be translated into a homeoÂ­pathic prescription. 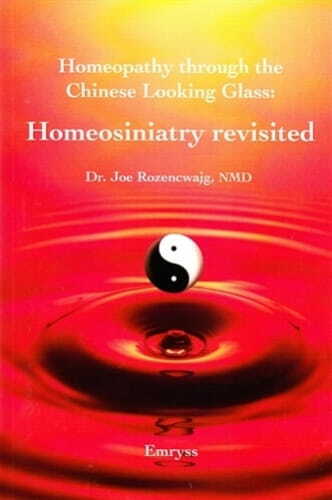 Dr Rozencwajg starts by offering a brief description of the Chinese model; with each facet he takes the key qualities and indicaÂ­tions and translates them into homeopathic rubrics. For example, he starts with Yin and Yang and produces two computer analyses. The results are mostly predictable but with some surprises: some polycrests (notably Nux vomica, Calcarea and Lycopodium) are equally prominent in both lists and Belladonna is fairly high on the Yin chart which might seem odd considering its fiery heat and redness; however, one must not forget the polarity within each of our homeopathic remedies or the fearful, stammering and reserved aspects of the constitutional Belladonna type. The Elements - Wood, Fire, Earth, Metal and Water - have their organ affinities outlined and some remedies that correlate with them. For example, Water is the most Yin of the elements with an affinity for kidneys and bladder; emotional characteristics might be primordial fear and endogenous depression; linked remedies include Arsenicum, Lycopodium, Silica and Mercurius. To return to the business at hand, so to speak, Po, Houn, Yi, Zhi and Shen are the enerÂ­gies that relate most specifically to emotional and mental characteristics and are linked to the solid organs as are, of course, the seven emotions that lead to pathology (joy, anger, contemplation, grief, fear, terror and anxiety). The pattern of presentation here is the same -take rubrics that describe the characteristics of these phenomena, computer repertorise them and print the result so that we can see which remedies seem to tie in best. Weak, old depressed, soft pulse, sharp, stitching, stabbing pains; intolerance to cold weather; perspiration, backache and weakness are three characteristic symptoms; physical and intellectual weakness. Tongue pale, white, greyish; painful vesicles. Pulse weak, soft, rapid, intermittent. TCM: cold, humid, deficit of qi in kidneys, deficit of yang. This is not a long book and much of it is taken up with the repertory. The TCM in itself is necesÂ­sarily extremely simplified and brief, doing little more than providing definitions in many cases. It is a valiant attempt, however, to make an extremely complex model of health and disease more comprehensible to the Western mind, and the author's clarity of writing style goes a long way towards making this happen. If one were adept at both TCM diagnosis and homeopathy, as he obviously is, I can see the fascination in trying to tie the two together in this way but, as Dr Rozencwajg himself points out, the two systems are not an exact match and quite a lot of compromise and interpretation seems to be required to arrive at a homeopathic prescripÂ­tion. It is another tool for the toolbox for all of us, though, and one that could definitely be of value in treating the 'closed' patient who is not going to volunteer readily the information needed for an indepth prescription. Dr. Rozencwajg, for many years a surgeon, then an enthusiastic practitioner of acupuncture, herbalism and homeopathy etc, has written this book to help homeopaths to find the remedy faster for taciturn patients. Homeopathy, a wonderfully elegant and economical energy system therapy, lacks an energetic pathology of disease that even begins to approach that of Chinese medicine. Although the latter's philosophy of disease is highly sophisticated, Chinese medicine still uses words rooted in people's experience, in observation, listening, palpation, questioning. It differs from modern medicine in its underlying model of health, which is 'energetic'. Does the system the author proposes work? Yes it does, as your reviewer can attest, having used Chinese medicine for 30 years, not just as he suggests and for students of homeopathy but also to help homeopathic patients understand their conditions better. However, not so fast! The problem is that you have two major systems. Each has an extensive philosophy and then in homeopathy you need to learn the remedies and how to choose and use them, and in Chinese medicine the different systems (including meridians, zang-fu, five elements, eight conditions, yin, yang, qi and blood etc, the herbs and their actions) and how to apply all this, via acupuncture, herbalism etc. Most people take years to get on top of even one of these, let alone both. Having taught Chinese medicine to homeopathic students for 25 years, I can tell you they love it: it successfully explains a huge amount. But as to applying it? I would guess that few of them use it much. Why? Because what is made easy to understand in lectures is often much harder to apply in practice. Also, because the art and science of homeopathy is not only inspiring but also very practicable, many homeopaths will feel they don't need yet another way of understanding what is going on. The book swiftly covers the basic ideas in Chinese medicine already mentioned, plus the seven emotions as causes of disease and the organ-emotion relationships and their pathologies. The author provides extensive remedy lists for each Chinese medicine rubric. He also covers what are called the five 'shen' or spiritual aspects of the organs, (shen, po, houn, yi, zhi) an important topic. He then provides a concise materia medica of remedies with their explanation in Chinese medicine, including tongue and pulse. The second hundred pages are basically a repertory giving for each Chinese classification the remedies, analysed from MacRepertory and Reference Works TM: let us hope the publishers of those programmes include his rubrics in future. As the author says, there are not many books on this subject, though he may like to read books by Dr Yubraj Sharma which give a far more precise oriental diagnosis of the remedies. He freely admits his book is a work in progress. There are some small mistakes in it, and in a few cases I would disagree with him but: should you buy it? Well, yes, if you want help in applying a knowledge of Chinese medicine to homeopathy, but perhaps you should learn to apply Chinese medicine first.